On Tuesday, April 2 from 8:00 a.m. — 10:00 a.m., join KUER staff and reporters at La Barba Coffee in Draper for a cup of coffee or tea in celebration of our Spring Fund Drive. For a $10 donation to our Spring Fund Drive (happening March 30 — April 6, 2019), you will receive one of our collectible Mug Stop mugs, and a free cup of coffee or tea from La Barba to test it out! Tuesday, April 2 | 8:00 a.m. - 10:00 a.m. The spring mug artwork was submitted by listener Aelias McHam, who had this to say about the design: "There are special things that happen every day, even though every day might seem the same. We need to do our best to find those moments and cherish them because when we do we see life in a new perspective." These mugs are only available at one of our four Spring 2019 Mug Stops. Link to Facebook event page. On Saturday, April 6 from 10 a.m. — noon, join KUER staff and reporters at the The Bean Yard Coffee House in Sandy for a cup of coffee or tea in celebration of our Spring Fund Drive. For a $10 donation to our Spring Fund Drive (happening March 30 — April 6, 2019), you will receive one of our collectible Mug Stop mugs, and a free cup of coffee or tea from The Bean Yard to test it out! On Thursday, April 4 from 8:00 a.m. — 10:00 a.m., join KUER staff and reporters at the Red Moose Coffee Company in Salt Lake City for a cup of coffee or tea in celebration of our Spring Fund Drive. For a $10 donation to our Spring Fund Drive (happening March 30 — April 6, 2019), you will receive one of our collectible Mug Stop mugs, and a free cup of coffee or tea from Red Moose Coffee to test it out! On Saturday, April 20 from 9 a.m. — 11 a.m., KUER staff are heading down south for a Mug Stop at the River Rock Roasting Company in La Verkin. For a $10 donation, you will receive one of our collectible Mug Stop mugs, and a free cup of coffee or tea from River Rock to test it out! 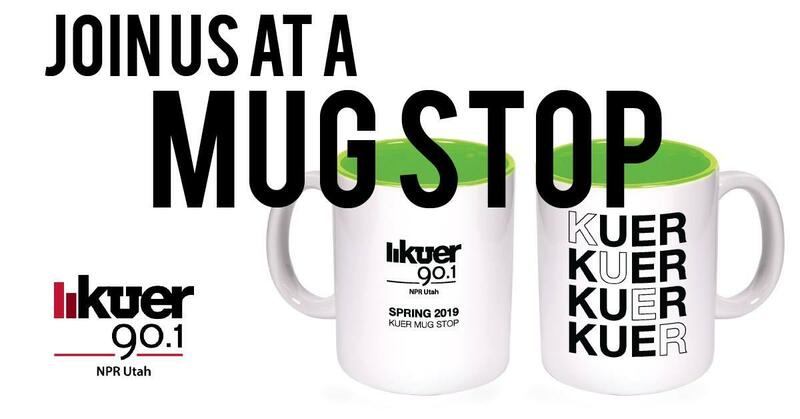 On Friday, April 19 from 9 a.m. — 11 a.m., KUER staff are heading down south for a Mug Stop at the Xetava Gardens Cafe in Ivins. For a $10 donation, you will receive one of our collectible Mug Stop mugs, and a free cup of coffee or tea from Xetava to test it out!